Regular cleaning and maintenance of your dryer and its connected ductwork helps prevent dryer fires. 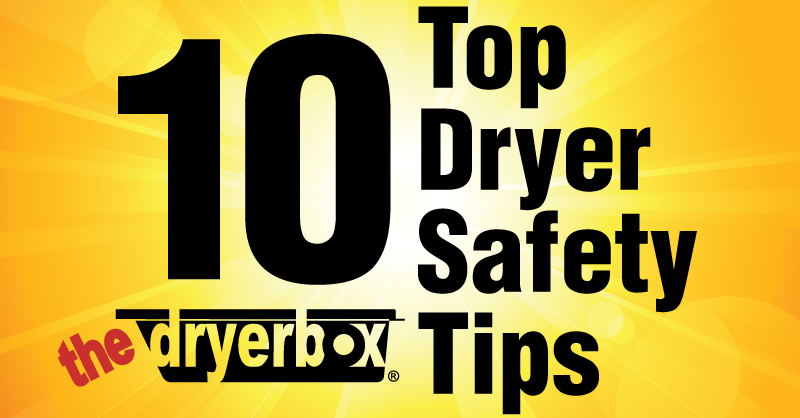 Here are the top 10 dryer safety tips compiled by the NFPA's Public Education Division. Have your dryer installed and serviced by a professional. While it may seem like a simple task, you are dealing with a large appliance that could get damaged if you attempt to do it yourself. Do not use the dryer without a lint filter in place and make sure you check it before and clean it after each load of laundry. Remove the visible lint that has collected around the drum, also. Rigid or flexible metal venting material should be used to sustain proper air flow and drying time. The DryerFlex provides a way to vent from your dryer while maintaining a 4" round route. Make sure the air exhaust vent pipe is not restricted. Once a year, or more often if you notice that it is taking longer than normal for your clothes to dry, have a dryer lint removal service clean out the vent pipe for you. They may be able to alert you to potential fire hazards. Keep dryers in good working order. Gas dryers should be inspected by a qualified professional to make sure that the gas line and connection are intact and free of leaks. Electric dryers don't require the same level of kid gloves, but do need to be maintained according to the manufacturer's instructions. Make sure the right plug and outlet are used and that the machine is connected properly. If you use a converter plug or attempt to change the socket without a qualified professional, you may run the risk of an electrical fire. This could also damage the internal parts of the dryer. Follow the manufacturer’s operating instructions and don’t overload your dryer. Always keep the manuals for appliances in a safe place so that you can refer to them for correct operations. Turn the dryer off if you leave home or when you go to bed. Never leave a running dryer unattended. If a fire starts, you may be able to avoid the entire home being damaged by quick action from a fire department. Keep the area around your dryer clear of things that can burn, like boxes, cleaning supplies and clothing. Don't leave laundry on top of the dryer, as clothing may fall behind, hindering proper airflow or damaging the hose. Check the outdoor vent to make sure it is not blocked and will open easily. The DryerWallVent allows air and lint to escape while helping to prevent animal intrusion and nests.